Photos added from my collection. Commercial broadcasting made its introduction a short time after World War I, and for the first time, programs of interest to the average family were "on the air". The radio audience with their one, two, or three tube receiving sets created the need for a Repair Service convenient to the set owner. If these early types of radio sets had become "service orphans", the progress of the electronic industry in general would have been small indeed. The first Radio Serviceman was usually a clerk In a department or hardware store where phonographs were sold. His tools were similar to those one would expect to find in a general electrician's kit since they were primarily used for installing aerials on new sets being sold or demonstrated. When a radio set owner complained about low volume, the trouble was usually remedied by replacing the batteries, headset or speaker cords, or perhaps a tube which would not "light up". All trouble-shooting was done by the substitution method simply because there were so few components In a radio set. practically any part suspected as being faulty could be removed without using a soldering iron. There were only two or three types of tubes on the replacement market and most radio sets used the same type number in all three sections of T.R.F. sets. Testing Equipment for servicing radio sets was unheard of and the only instruments used were battery checkers. One type was an ammeter for checking drycells ("A" batteries) while the other was a voltmeter to test the "B" and "C" batteries. 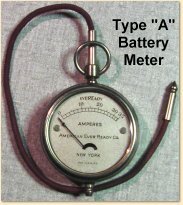 These meters were usually housed in nickel plated cases and resembled a pocket compass. Sometimes an ingenious person would place one of the meters in series with a battery and use the arrangement for continuity/measurements, but, more often a headphone set was the preferred indicator of short and open circuits. Near the middle "20's", radio sets began to get more complicated and a repair job was more than the phonograph or hardware salesman could handle. The batterires were being replaced by power-packs which operated directly from an A-C supply outlet. Tuning condensers were being ganged together for single control operation and the R-F amplifier, detector or A-F output tubes were no longer interchangeable with each other. There were entirely too many parts in the new sets to make substitution a practical method of locating trouble. In order for a full time radio serviceman to stay in business it was essential that he make efficient use of his time in analyzing a faulty set. Even with a thorough knowledge of the radio circuits in use, he was handicapped by the lack of apparatus to make preliminary tests thus confirming or contradicting his diagnosis. 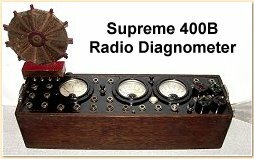 During the past two decades, SUPREME has offered the radio service industry a number of instruments to aid the dealer and technician in promptly and efficiently locating faults of electronic components. The forerunner of all testing equipment for the radio serviceman was the famous "400B". Although it did not have the features created by new electronic developments such as found In the Model 504-B, it was certainly built to stand years of obsolescence free use. Let us look at the development of service instruments which elevated the radio technician to a new status. It was realized that the radio serviceman had no applications for the delicate, nonportable electrical measuring apparatus found in the larger engineering and university laboratories. Furthermore, too much time was required for getting this elaborate apparatus set up to make the test and then more time was needed to interpolate the results of the data obtained. The initial investment, as well as upkeep, was far out of reason when common-sense economic principals were applied to the cost of making a simple test, and the expected revenue for such technical services. BY combining several essential instruments and designing a unit so that some of the meter indicators and sockets could perform a number of functions, the cost was reduced to within reach of those who needed It for trouble-shooting. The SUPREME 400B was the first unit of this type. It Incorporated a multi-range D-C voltmeter, ammeter, as well as an A-C voltmeter. In this same instrument was also a fixed frequency oscillator, mutual conductance tube tester, tube matcher and rejuvenator operated in conjunction with a free reference point analyzer. Stimulated with adequate service for new radio products, the electronic Industry developed into a healthy international business. There are still some distributors, service dealers, and engineers who can remember the SUPREME 400B and its successors, the Models 444 and AAA-1. There are many more who entered the field In time to use the SUPREME Master Diagnometer, and perhaps the models 385 and 585 Automatic Diagnometers. The first tube tester (a part of the 400B Diagnometer) required facilities for testing only five types of tubes, however, It successfully handled the twelve new types which came into existance several years later. The first SUPREME tube testers checked the 'mutual conductance by the grid-shift method. Later, these were replaced by the more efficient emission type tester. 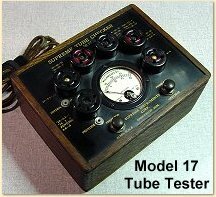 Many service dealers wanted separate tube testers for counter use and SUPREME produced the Models 17, 18, 19, 30, 35, 40, 45, 50, 55, 65 88. 86, 89, 400, 501, 503, 505 and 506. The model 589 or 589-A needs no introduction as It completes its ninth year in setting a record of being the most obsolescence free tube tester ever offered to the radio industry. The "Oscillators" in the early type diagnometers developed into full-fledged signal generators. Stepping stones in this field of research were the models 60, 61, 70, 180, 189, 670, and 571. The overall results in building an adequate signal source are demonstrated in the well known Model 576 which is still in production even though we are having difficulty in keeping our distributors supplied due to the heavy demand for this unit. For those servicemen using the cathode ray oscilloscope in alignment work, SUPREME pioneered with the combination signal generators. The Models 580, 581, and 582 produced a volume of knowledge in this field which resulted in the model 561 now in its eighth year of production. With the advent of high gain amplifier tubes, the once very popular "Free Reference Point System of Analysis" (twin jacks, analyzing cable and adapters) gave way to the Dynamic Analyzer which was called the Model 560 Vedolyzer. 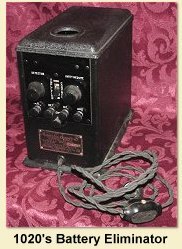 Later, the Model 562 Audolyzer made radio instrument history and is boasting nearly eight years in SUPREME catalogues. As the radio repair establishments grew In size and number of personnel, there was need for small portable multimeters and the demand was always answered by SUPREME with an assortment large enough to make a suitable selection. The models leading up to the compact, efficient and economical types found in radio repair shops are too numerous to list in this article. Most small shops still prefer the combination tube testers and multimeters (features of the famous Diagnometers). The first unit known as a tube and set tester was the Model 89-D and continued with the Models 400, 500, 502, 504-A and 599. The Model 504-B and Model 599-A. Tube Battery and Set Testers are typical examples of portable laboratories at low cost per instrument unit. For the "old-timers" who boast the fact that they have used SUPREME INSTRUMENTS ever since they started servicing, these notes may offer a few minutes of relaxation In reminiscing of younger days. These "old-timers" have played a great part in developing test equipment as we know it today and the new comers will be the "old-timers" of tomorrow only if they keep pace with a fast moving radio servicing industry.